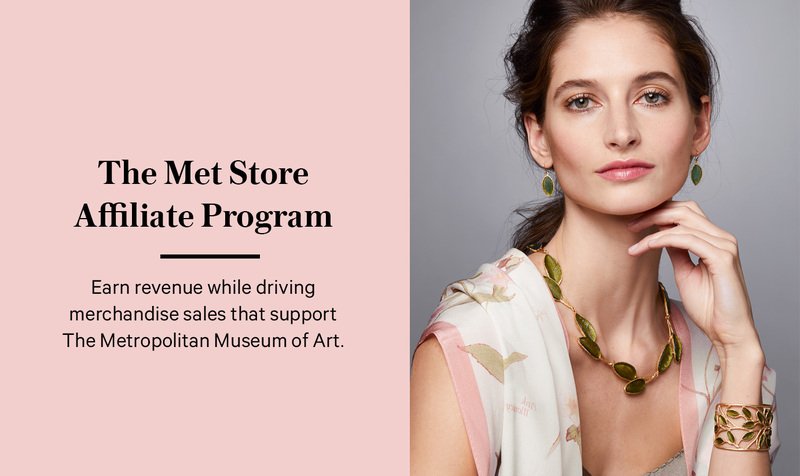 The Met Store offers a selection of merchandise inspired by New York's Metropolitan Museum of Art's exhibition program and unparalleled collection which spans more than 5,000 years of world culture. Our history dates back to 1870, when The Met created its first reproductions. Today we offer a broad selection of merchandise including jewelry, accessories, stationery, sculpture, wall art, Museum publications, and home goods. Every item we create is the result of careful research and expert execution by art historians, designers, and master craftspeople who ensure that each honors the original art object that inspired it. We also engage with contemporary artisans to source specialty products showcasing both traditional and cutting-edge design techniques. All purchases support The Met's collection, study, conservation, and presentation of 5,000 years of art. When you join our affiliate program, we'll supply you with text links and banner ads to be placed on your website. When your visitors click through to store.metmuseum.org and make a purchase, you earn a commission. It’s that easy and it's free to join! Performance reporting through our partner, Linkshare, a leader in affiliate marketing programs. Click here to apply. For more information, email us at themet@iaffiliatemanagement.com.